Clinical Lead for the NHS Trusts’ Suffolk Foot and Ankle Surgery Centre in Ipswich, Dale Halford undertook his surgical training in London, and currently provides consultations and surgery at three private clinics throughout Suffolk. Specialising in bunion (Hallux Valgus) surgery, forefoot reconstruction, big toe joint replacements (Cartiva and Silastic implants), and shockwave therapy, Dale works with self-paying and insured patients in Ipswich and Bury St Edmunds, through to Newmarket and Thetford. 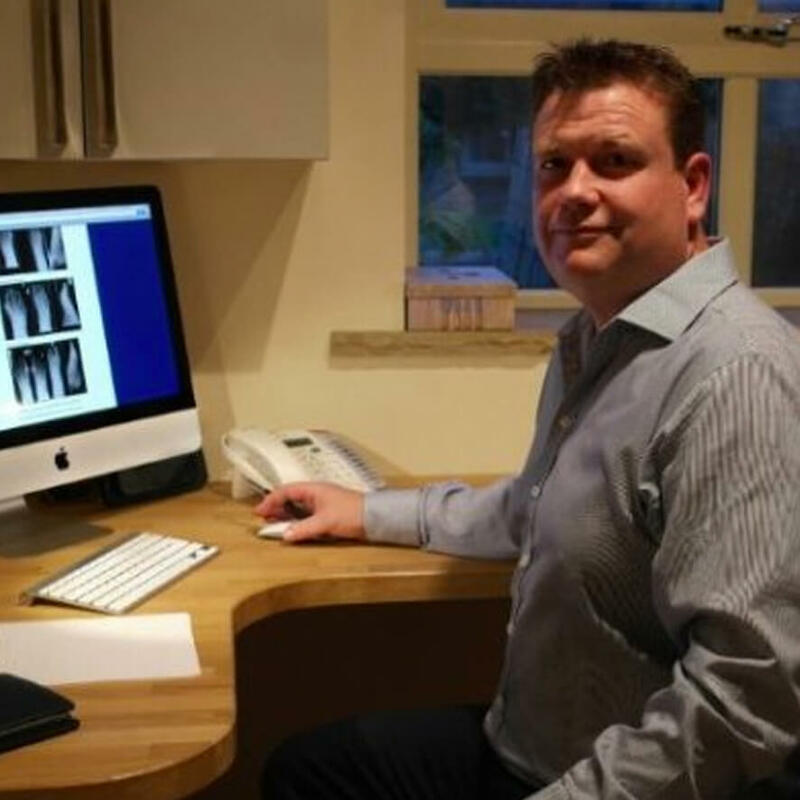 Having qualified from Durham School of Podiatry in 1986, Dale went on to work in the NHS for two years, before establishing two successful private practices in Halifax and Ilkley. In 2001, he embarked on a Fellowship in Podiatric Surgery at University Hospital Lewisham, which he was awarded in 2004. Dale then completed his surgical training in Doncaster as a Podiatric Surgical Registrar. Having received his Certificate of Completion of Podiatric Surgical Training, Dale accepted his first consultant post in Durham in 2007, before transferring to Hartlepool a year later. Since 2010, Dale has been working in Suffolk where he was appointed Consultant Podiatric Surgeon and Clinical Lead at the Suffolk Foot Surgery Centre, part of Ipswich Hospital Trust. Currently operating out of four clinics (both NHS and private), Dale also works as a consultant at Physiomed in Leeds, close to his home town of Bingley. Having close links with other clinics is important to Dale, which can be seen through the inter-disciplinary care offered at The Abbeyfields Clinic in Bury St Edmunds; Stow Health, Stowmarket; and Nuffield Health in Ipswich. Specialising in Hallux Valgus (bunion) surgery, joint replacements in the forefoot and lesser toe straightening, Dale has also developed an interest in the revolutionary Cartiva toe implant, which provides a flexible alternative to fusion for sufferers of big toe arthritis (Hallux Rigidus). Dale maintains a particular interest in revision forefoot surgery. Foot surgery; Forefoot reconstruction; Hallux Valgus (‘bunion’); Tailors Bunion; Foot pain; Hallux Rigidus; Joint replacements; Cartiva implant; Hammer toe; Claw toe; Mallet toe; Neuroma; Ingrown toenails; Local Anaesthesia; Bunion; Heel pain; Plantar fasciitis treatment; Shockwave therapy; Mid foot fusion; Joint and soft tissue injections; Orthotics; Big toe arthritis; Steroid injections; Cartilage resurfacing implant.